Re: Caution: What happened to the money raised for scammed Vietnamese tourist? What happened to the money raised for scammed Vietnamese tourist? Many netizens felt sorry for the Vietnamese tourist who begged for a refund after he was allegedly conned into paying an exorbitant sum for an iPhone, raising more than $15,500 online for him last November. But five months later, most of the money is still unused and only about $200 has gone to the tourist, sparking questions and criticism from donors. Entrepreneur Gabriel Kang, 37, the man behind the fund-raising effort, told The Straits Times that over $9,000 is still left in the kitty. 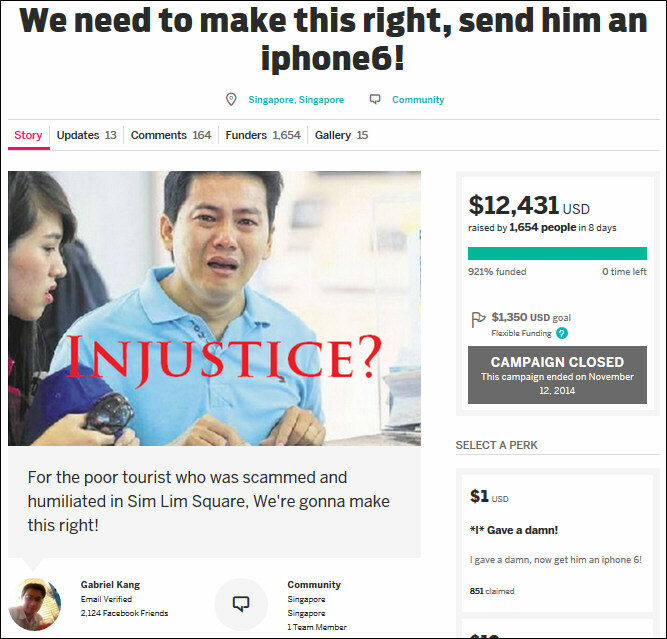 He started a campaign on crowdsourcing site Indiegogo last November to buy an iPhone for the tourist, Mr Pham Van Thoai, who allegedly fell prey to an unethical retailer at Sim Lim Square. After deducting charges from Indiegogo and payment site PayPal and currency conversion, Mr Kang received about $13,940, which was transferred to his bank account. He used $1,538 to buy an iPhone 6 Plus for Mr Thoai but the latter declined the gift, though he accepted about $200 worth of food items, such as kaya. Mr Kang later auctioned off the phone and used the money to buy an air ticket for a Vietnamese woman who claimed to have been trafficked out of her country, and medical supplies, sweets and toys for Thien Binh Orphanage in Dong Nai, east of Ho Chi Minh City. But some donors are unhappy that they were not consulted. Student Abraham Lee, 23, who gave US$50 (S$68), said: "I wanted the money to go to Mr Thoai. Now that he doesn't want it, it is not right of Mr Kang to give to any charity of his choosing." Computer engineer Jonathan Hoo, 28, who gave US$20, said: "I was shocked to learn that (Mr Kang) paid for an air ticket for a woman he never met. That was not the original purpose of the donation." In recent months, other online crowdfunding campaigns have also been started to help the unfortunate, including a fish farm hit by a plankton bloom and a pump attendant cheated of $400,000. But the controversy over donations for Mr Thoai has raised questions about such fund raising. When contacted, the Office of the Commissioner of Charities noted that the Charities Act states that when a donation cannot be used for the charitable purpose communicated to the donor, the amount should be refunded. Or it should be used for another charitable purpose similar to the original aim. On his part, Mr Kang said he wanted to "use the money to help others who had been scammed". He added that he made an effort to be accountable. For instance, he visited the orphanage in Vietnam for two weeks last December. He decided to help after he found out that the place, which is run by church members, had children who were ill but had no access to medicine. During his trip, he paid for his air ticket, hotel and food. One challenge he faced was getting receipts for the fridge and medical supplies he bought for the orphanage. "The way they operate is very different from the way we do. You don't get a receipt for everything." He said he was careful to use only the $2,000 he received from auctioning off the iPhone. Mr Kang plans to set aside $3,000 for Mr Thoai's next visit to Singapore "whenever that may be, to pay for his hotel, food and air ticket". He hopes to use the rest of the funds to help scam victims get their money back. Asked if he would consider refunding donors, he said: "I am exploring options on what to do with the (remaining funds). I'm looking for a way to use the money to help other scam victims... I don't want to use the money frivolously."